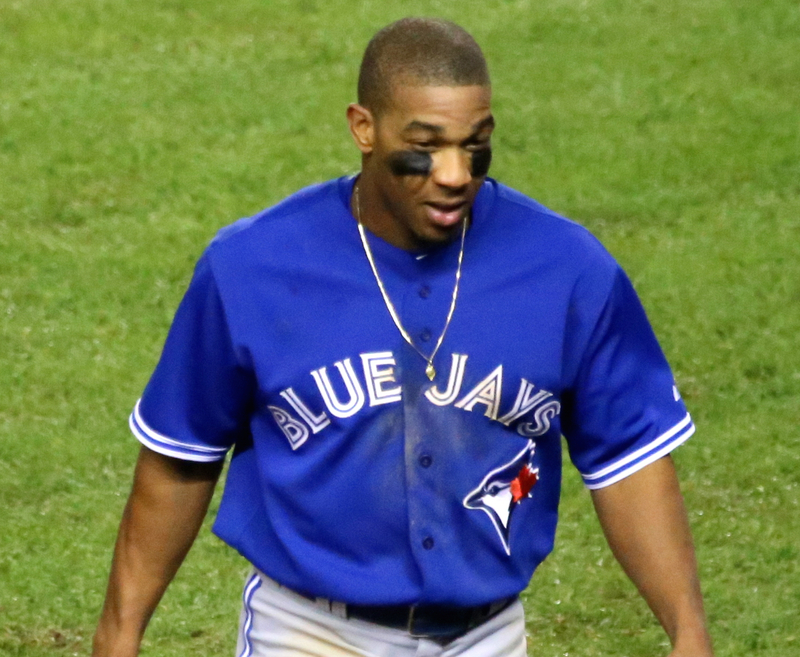 In 2015, Toronto had left field problems – Michael Saunders couldn’t get healthy, Dalton Pompey failed to immediately hit MLB pitching, and Chris Colabello and Danny Valencia proved incapable of catching enough flyballs. Revere came in via trade and stabilized the position well with a 102 wRC+ as a Blue Jay during the regular season. For Revere it was his fifth straight season producing like a league average outfielder. He ended up with 1.9 fWAR, so his overall talent level hasn’t changed much since his rookie year for the Twins when he was worth 1.5 fWAR in 117 games. In between these years, he was worth 2.8, 0.8 (88 games), and 2.1 fWAR. So for his career Revere has been worth 1.985 WAR per 600 PA – he’s as average as they come. The first public projection system to comment on 2016, however, does not love Ben Revere. Steamer projects Revere to worth only one win over 600 PA. This might seem odd, but the system could be picking up on Revere’s defensive decline. Revere’s defensive value according to UZR has fallen rapidly in his brief career. Early on with the Twins he was a good CF and RF. With Philadelphia he was a below average CF, and in 2015 he was actually a below average LF. That’s not a great trend. Still, some of the problem in 2015 might have simply been inexperience reading balls in LF, which should be semi-correctable. The offensive trend in his career in terms of both hitting and baserunning has been positive growth to this point. I think Steamer is a bit too pessimistic on him. Toronto has control of Revere through 2017. As a Super Two player, these will be arbitration years 3 and 4 for Revere. He earned ~$2M in arb 1 and ~$4M in arb 2, so we could reasonably expect him to earn something like $15M through arbitration in his age 28 and 29 season, combined. If one WAR is worth around $7.5M, Revere should be a slight asset, unless you’re as pessimistic on him as Steamer is, in which case he’s worth nothing. Toronto should try to trade him this offseason. Dalton Pompey needs to be given every chance to stick in the big leagues as a starter in 2016. He tore the cover off the ball in the minor leagues after his demotion this year and then came up and displayed skills and maturity in a limited bench role in September and October. The team dealt away a lot of its upper minors talent to make the 2015 run happen, so having a cost-controlled and talented player like Pompey grab a long term role as the core of the team continues to age would be ideal. Behind (or in front of) Pompey, Toronto could also have the 2016 wild card Michael Saunders. Saunders has a lot to prove and not a lot of value left, so like Smoak last offseason, the team might be able to non-tender him before bringing him back at a reduced salary. With outfield depth for Toronto being five names deep and numerous starting pitchers on their way out of town, exploring a trade of Ben Revere for an arm makes lots of sense. Cashner is a big name with a big arm, but he’s never been fabulously productive. From 2013-2015 with San Diego he passed the 2 fWAR mark every year, but has never touched 3 wins, thanks to various arm/shoulder/neck/finger ailments. Steamer likes him to be worth 3 wins in 2016, but is too high on his playing time (32 starts and 193 innings would both be career highs). Cashner’s run prevention has been enhanced by Petco but perhaps not as much as other pitchers, due to his high groundball skill (career ERA is 3.59, career SIERA is 3.78). This would speak favourably towards a potential American League transition. He’s entering his final year of team control in 2016 and would probably get a slightly higher arbitration award than Revere, according to MLBTR/Matt Swartz. The Padres could feel like they need to add an established OF this offseason. They have Matt Kemp and Wil Myers pencilled in for 2016, but Kemp is a disaster defensively and they should really think about playing him at first base (something they actually had Myers do a bit in 2015). Behind these two, San Diego has depth players like Travis Jankowski, Alex Dickerson, and the player formerly known as BJ Upton. They also have incoming prospects Rymer Liriano, who probably deserves an extended look in an OF corner, and Hunter Renfroe, who could be ready later in the season. Starting pitching depth exists for San Diego, which is why dealing a more expensive arm like Cashner could make sense. In addition to Cashner, they have Shields, Ross, Robbie Erlin, Casey Kelly, Colin Rea, Corey Luebke, and Odrisamer Despaigne. Most teams need more than seven starters to make it through a year, so in a hypothetical Revere-Cashner trade, Toronto might be asked to throw in a piece of SP depth with negligible value, such as Taylor Cole. Cashner probably also carries more “name brand” value, which means we might probably be looking at Revere + a secondary piece of value for Cashner. Chavez was a Blue Jay for a brief period in 2012 before being traded to Oakland for cash. In Oakland he’s been pretty successful as a swing man, making 47 starts and 54 relief appearances while pitching to a 3.76 FIP and similar ERA/xFIP. From 2013 through 2015 he has actually been Oakland’s third most productive arm by fWAR, amassing 4.3 wins, which is behind only Kazmir and Gray. Oakland has a long list of starting pitching depth though, thanks in part to the Donaldson trade. In 2016 their depth chart could include all of: Gray, Nolin, Graveman, Bassitt, Griffin, Hahn, Pomeranz, Doubront, and Brooks, with attractive and intriguing prospects Sean Manaea and Dillon Overton also close to the majors. They have some arms to spare and Jesse Chavez is entering his last year of control, where he should make almost $5M through arbitration. Steamer projects him as a starter and thinks he’s good for over 2 WAR in a full season. In the outfield, Josh Reddick and Billy Burns should man CF and RF, but LF could be open. CoCo Crisp is still under contract but he was not healthy or good in 2015, and with a big vesting option for 2017 based on plate appearances, Oakland should think about shifting him into a bench role. I don’t think it’s likely that Billy Beane would want Ben Revere, but it’s possible. He did give Billy Butler a free agent deal after all, and I never though Country Breakfast would be Beane’s type of player. Maybe Oakland’s internal projection systems would appreciate Revere’s track record and age and peg him as an above average regular over the next two years. The value lines up here, either way. Niese wasn’t very good in 2015, is owed $9M next year, and is a big injury risk whose arm could fall off at any moment. He also doesn’t fit into the Mets rotation anymore with the five slots presumably being spoken for by Harvey, DeGrom, Thor, Matz, and Wheeler in 2016. These are the reasons New York will want to move Niese. On the positive side, Niese’s arm is still attached to his body and outside of 2015 he has been a decent #3 starting pitcher. From 2010-2014, Niese ranks 45th in baseball in SP fWAR with 11.3 wins, and his xFIP ranks 42nd at a tidy 3.64. While he seems to find the DL every season with some sort of shoulder, arm, or elbow strain, he’s avoided disaster every time and managed to make 24+ starts each year since 2010 while throwing strikes, getting a lot of groundballs, and his fair share of strikeouts. $9M is a lot to pay for a swing man, but a good price to pay for a starter with Niese’s career stats. His contract also includes team options for 2017 and 2018 with modest buyouts, and we all know how much Alex Anthopoulos likes his team options. If the Mets don’t sign Cespedes then their 2016 outfield will consist of Conforto, Lagares, Granderson, and Cuddyer. Conforto and Granderson would be locks to start, but Cuddyer is just bad at baseball at this point and should be a bench player in 2016. Lagares has been hindered by elbow discomfort since September 2014 and his defense suffered in 2015 as a result. It’s possible that he’ll need surgery this offseason to correct the problem. If that’s the case, then the Mets could feel like they need to add an established outfielder. This might be the most likely trade suggestion so far. Tomlin is 31 years old and entering his final arbitration year, where he’ll make something close to $3M according to MLBTR/Swartz. He only made 10 starts for Cleveland in 2015, and ended up with a big DIPS-ERA disparity. His ERA was excellent at 3.02, his SIERA and xFIP were decent at 3.46 and 3.77, respectively, but his 4.43 FIP was poor. We can’t glean too much from 10 starts though. 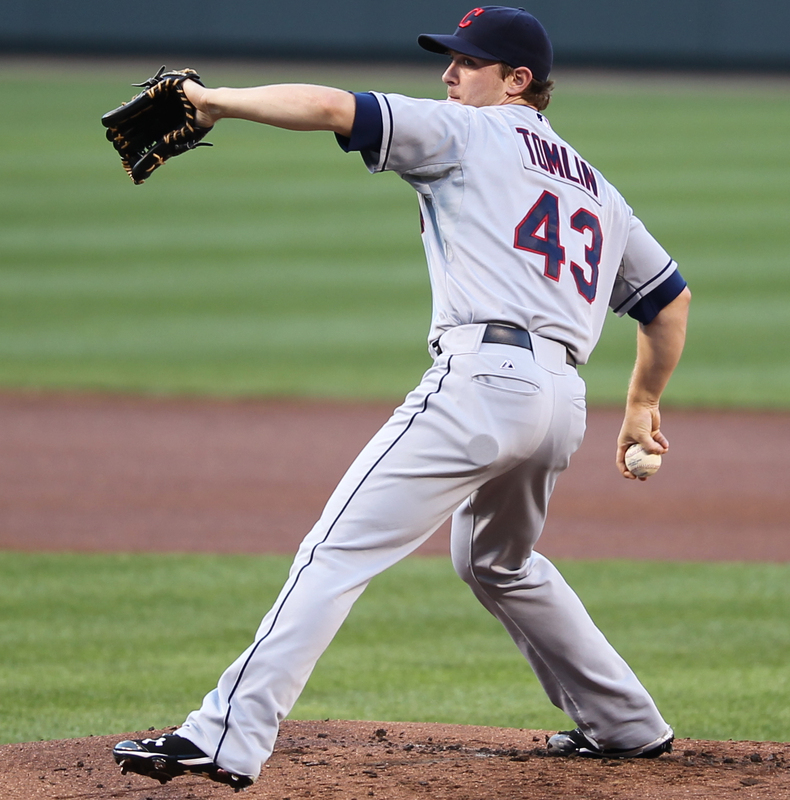 Steamer is fairly high on Tomlin and thinks he’d be worth 1.8 fWAR in 26 starts. It’s hard to disagree with this, since Tomlin has basically always been that good when given MLB playing time. He accrued 1.6 wins in 2011 when given 26 starts, and was worth 1 WAR in 2014 in 104 innings. Tomlin might not have eye-popping stuff but he’s a strike thrower with a track record of producing when called upon, and for a team with big SP holes like Toronto, he’d be a pretty nice piece to start the season with as your swingman, especially considering his modest price tag. It’s Josh Tomlin in action! Further, Cleveland could use a decent OF more than any other team mentioned so far. The Indians finished the year with an atrocious active outfield of Mike Aviles, Lonnie Chisenhall, and Abraham Almonte. The only OF on their roster who projects to be above league average in 2016 is Michael Brantley. The team needs line up so well here that I have to think that this trade would be available if Toronto wanted to do it. Cleveland has holes in the OF and an embarrassment of pitching riches. Heck, Toronto might even be able to ask for a kicker of some sort to be added to the deal. Swapping Revere for Tomlin would save the team a bit of cash, move a positional strength for a need, and open up a full time job for the deserving Dalton Pompey. In my opinion it wouldn’t be unlike the Lind-Estrada trade from last offseason. A lot of fans were scratching their heads on that trade early, but Estrada made them all come around on it in time.